It's the day before Thanksgiving and in my mind, I feel like I should fast in preparation for the gluttony that awaits. Anyone else? Instead of fasting though, I will be eating light today. 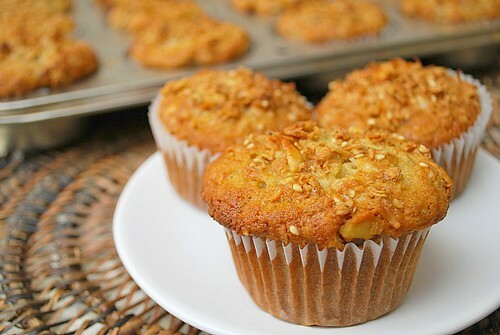 To start off, I made these Banana Crunch Muffins for breakfast. These would have to be my favorite banana muffins ever. Aside from the true flavor of banana in each bite, the crunchy homemade granola swirled in and sprinkled on top added such great texture. I'm going to have to play with this recipe using other fruits! My first thought after having one of these muffins was why it never occured to me to use granola when making muffins. Secondly, I wonder what took me so long to make homemade granola! The granola is stirred into a straightforward banana muffin batter made with both mashed ripe bananas and diced up bananas. This ensures full banana flavor and makes for a moist muffin. My favorite part of this muffin though was definitely the granola. I was writing up my grocery list before making this recipe and after writing 'granola' on the list, I looked for a granola recipe out of curiosity. When I found a recipe using what I already had on hand, I decided to make it... and wow - it was so quick and easy. Even better was how great it tasted. I couldn't stop munching on it after it cooled and almost didn't have enough for the recipe. So I've included the granola recipe I made below but if you prefer to purchase it out of convenience, that's completely okay too. I think if you made granola from scratch just once, you'll never buy granola from the store again. Line 18 large muffin cups with paper liners. Sift the flour, sugar, baking powder, baking soda, and salt into the bowl of an electric mixer fitted with a paddle attachment. Add the melted butter and blend. Combine the eggs, milk, vanilla, and mashed bananas, and add them to the flour-and-butter mixture. Scrape the bowl and blend well. Don't overmix. Fold the diced bananas, walnuts, granola, and coconut into the batter. Spoon the batter into the paper liners, filling each 1 to the top. Top each muffin with dried banana chips, granola, or coconut, if desired. Combine both mixtures and toss to coat everything, then pour onto 2 sheet pans. Cook for 1 hour and 15 minutes, stirring every 15 minutes to achieve an even color. If you prefer the granola isn't too dark, feel free to remove from the oven sooner.